Thermocouple is the most common sensor in Industrial Temperature Measurement. 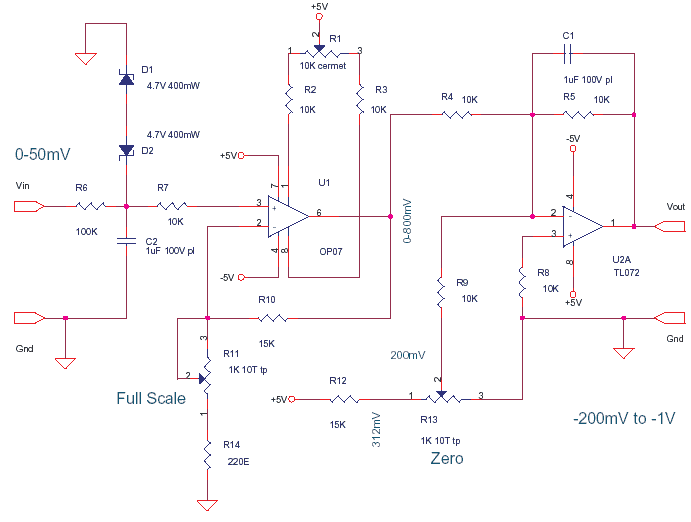 The Signal Conditioning involves Cold Junction Compensation and High Gain DC Amplification. The output of a Themocouple is in millivolts. The OP07 is a low offset 75uV opamp, here it is used to amplify the output of a Thermocouple, the gain of this stage is high. The zeners are to protect any high voltage at input zapping the opamp. The Resistor R6 limits the current. The zeners should be low leakage or use clamping pull-up and pull-down diodes to +5 and -5 respectively. The RC low-pass filter formed by R6 and C2 reduce the mains hum or 50 Hz pickup of long thermocouple cables laid close to high current heater wiring. R1 is a offset null use or add if required. R11 is gain control of OP07. The TL072 is a FET input opamp used here as a summing amp. Adding one more inverting amp with some gain to the output of this circuit can give you a 1-5V suitable for ADC or PC analog I/O cards. C1 also serves to filter, it is an integrator here. It suppresses EMI and RFI from motors, contacters etc., R13 sets an output value for 0mV input.